Spyderco makes a hell of a good knife. Of all my various EDC folders, my Native gets the most use. It’s the perfect size and it’s held up spectacularly under all sorts of use. I’ve yet to find the “perfect” folder (and I’ll never stop trying LOL) but this one is as close as I’ve come so far. Earl, I totally agree. The Native is just an awesome EDC option. Light, slim, great steel – so much to love. I personally carry a Sage 1 a lot – very similar to the Native, but has some nice refinements. More expensive though! Thanks for reading man. Greetings, I came to/discovered your site via a link from another site, I’ve enjoyed reading the reviews of a few knives that I own, ones I don’t own and one that I’ll soon own, the Italian made SALUS (Combative Edge). Re: the Spyderco Native: I own two of them, had three, just sold one on Ebay. I love this knife, it is the only EDC I carry, however I carry and prefer the all black ‘combo edge’ version, for me it opens/deploys fast and smoothly, locks tightly, the two lower choils are perfect for my small to med. sized hand and the thumb jimping is superb and is easy to keep clean. I live in Manhattan, N.Y.C. and for the frequency of the tasks/uses I come in contact with daily, the combo edge is perfect for every one. The serrations are “EXTREMELY” sharp like sharks teeth. The other positive attributes of the ‘Native’ for me is that it’s incredibly light in weight and its small size fits in my pocket easily. Without going into depth, N.Y.C. has the most restrictive and archaic knife law/s in the U.S., so the ‘smaller’ the less chance of me going to jail if a Cop even sees the clip on the outside of my pants pocket. I never keep it clipped.. only “down in” my pocket…. which is theoretically legal, clipped is illegal, yes go figure! To close, I’m in love with the all black combo edge Native which stays literally “razor” sharp and if it was ever needed in a defensive situation I have no doubt it would go through clothes like butter, including a jacket. The only possible negative would be that the paint on the clip/s wear off easily, so what I have done to mine is take the clip/s off, sand them, apply a base coat of Rust-Oleum primer, then a coat of Rust-Oleum “Flat” black protective enamel. The “flat” keeps it from any shine thus being spotted easily. Great blade blog, enjoyed reading your reviews. Besides the Italian ‘SALUS’, there’s another Italian made blade I will soon purchase, the Italian made fixed ‘Extrema Ratio Fulcrum C.’ all black Tanto. Would enjoy reading your thoughts on that. First of all, wow, thanks for the very detailed comment. Awesome stuff, and my hope is others will benefit from your seasoned experience with the Spyderco Native (an awesome little knife as you so aptly described). I am not familiar with the NYC laws specifically (although I do know they are quite draconian) but I am glad to hear you are able to carry the Native. It’s a very capable EDC and you don’t sacrifice much (if anything) by doing so (as far as carrying a good EDC knife goes, I’d say the Native is near perfect in that respect). The all black combo edge definitely has it’s appeal, and I like your pocket clip modification a lot – I’ve got a couple knives that could benefit from that treatment. I am glad you have been enjoying the rest of the blog, I certainly have enjoyed writing reviews and such over the past couple years (well, year and a half really). The SALUS is a really nice knife, I am glad to hear it’s on your radar as I think it is woefully underappreciated. I have also heard great things about Extrema Ratio – I confess that I haven’t owned any myself, but a good friend of mine owns a number of them (including the Fulcrum I think) and he swears by them. Really rugged knives, the styling isn’t for everyone but if it grabs your attention then rock on I say. Well Mark, thanks again for the great comment. Stay sharp, and all the best from sunny S FL! Thanks for another good review! It could be that my hands are slightly smaller than yours as I have never found a knife that fits my hand better than my Native! That said, I can see how someone that very large hands could have a problem. My only gripe with my Native is, like you said, hard to deploy quickly. It sure would be nice if they added some bushings to make this knife smoother to deploy, but that is the only thing I can find to complain about. Thanks, and keep the reviews coming! Thank you, Shad! Yes, I think this is one of those “your mileage may vary” situations. I found it a little tight some reason for my hand, but I know plenty of people who can get a good grip on the Native. I wouldn’t argue if they made the knife a little smoother and easier to open, maybe the Native 5 is like that, I’ll have to get my hands on one at some point. More reviews coming (relatively) soon. I wish I had more time to pump them out but these days I’ve just been slammed with work. No stress, I just enjoy your reviews as they are well done without having “favorite” brands, or at least not letting it show too much. Thanks, Shad. I try to review what I like, and I also try to stay *reasonably* objective. Of course some bias will trickle in but that’s the nature of a personal review. At any rate I really appreciate you visiting the site and taking the time out to comment. I think the FRN Native is darn near the perfect EDC knife and I’ve been carrying mine to work going on 4 years now. BTW the more you use it the more it breaks in and I can flick mine open faster than my ZT assisted opening folder (a few drops of high quality gun oil on the pivot really help). I think that it is a fantastic value as well. Thanks for stopping by, DJ. Glad you really like your FRN Native. I agree that it has many qualities I look for in an EDC. Interesting to hear about the break in as well. Dan I picked up the Native 5 lightweight recently and loved it so much I ordered another for my son! Small and light, it lends itself well in a pairs of jeans without notice. 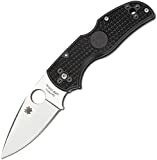 Wow what can you say about getting S35V on a full flat ground blade under $100 and made in the U.S.A. , well done Spyderco. Glad you enjoy your Native 5. Back in the day I thought this model was a real unsung hero of the Spyderco lineup. It still strikes me as a tremendous value and all around great option for EDC. I hope you and your son enjoy them! I found the Spyderco Native to be my perfect EDC. I believe my two are considered 2nd generation with CPM 440V (=S60V) steel. In 2002 I found a combo edge first which didn’t have the Boyd Dent. I used it until I found the same knife in plain edge. I had been a plain edge fan, but now having used both in the same knife platform, I find myself preferring the combo edge for EDC. I found your review of a later generation Native very interesting. My knives fit my hand very well, and open quickly and smoothly. The steel is very corrosion resistant, holds an edge very well, and I have no trouble maintaining the edge. The pivot pins have never loosened, and still remain perfectly adjusted. The handle has been very durable and generally comfortable. The pocket clip has never failed and has always retained the knife in whatever position I place it. 14 years and counting with a Native! You need to update this review and cut out the endurance 3 and 4 material. It’s a FFG now, not a hollow saber ground blade, doesn’t have a deep swedge anymore, the pivot isn’t pinned and is fully adjustable, the “Boye Dent” isn’t present anymore and is flat. It’s an excellent review and I enjoyed reading my way through it, it just needs some more detailed updating aside from pictures. Grant, You are absolutely right. I took some new pictures when I got the updated Native 5, but forgot to update the review itself. It’s back on the to-do list. Thanks, Grant. I updated it so much that I decided to republish it. It’s essentially a brand new review complete with additional new pictures. I appreciate the kind words and hope you enjoy this new review! Well said Dan! I appreciate how these reviews are always being updated, I thoroughly enjoyed this one. Thank you! Thanks, man. Since I started in 2011 I think it’s important that the reviews be updated as things change, my opinion changes, etc. I really appreciate your support of the site. Yeah that’s awesome man, I’m always seeing the update tags on the reviews. Keep it up! Great review, Dan. I received my first Native 5 when I was deployed to the Middle East. It was the special military-lottery version that Spyderco sent me for free. Very cool. I’m surprised at how good the ergonomics are. I wear a size XL glove, yet the Native 5 fits my hand beautifully in both grips. I also appreciate the Native 5’s locking mechanism. Eric Glesser has described it as the evolution of the back lock. I’ve been using my Native for a long time, and it still doesn’t have any up-and-down wiggle. I hope Spyderco eventually upgrades the Delica and Endura with the same lock. Again, thanks for a great review. Brad, Thank you very much for leaving a comment and some of your thoughts on the Native. I agree, it’s an extremely comfortable knife, which is not something I really expected either. And the lock does strike me as an evolution of the lock back. No play at all and great action. Not sure what they did exactly, but it works. The lock bar and spine of the blade are both thicker than the Delica and Endura. Perhaps that extra surface area plays a role. The Native 5 utilizes a pivot bushing, which is uncommon on a lock back. Perhaps that has something to do with it. Regardless, I also like the fact that the blade doesn’t “push up” during hard cutting. It’s a fantastic knife overall. Thanks for the great review. I love the Dragonfly2 for EDC, and would love a Dragonfly2 sized up to about the dimensions of the Native5. I think that would be about perfect for suburban EDC. And I think the Native5 is not all that far from being that. Will, My pleasure. Thanks for checking out the review. A good tweener to span the gap between the DF2 and Native 5 is the Chaparral. The new Lightweight version is supposed to be awesome. My guess is it channels the same lightweight utility and practical ergonomics that both the DF2 and Native 5 LW have. But this Native 5 is also excellent. One of Spyderco’s best in my opinion.